And here is a close up of the camera: there is something almost comic about the Heath Robinson quality of the Google survey cars, which look somewhat experimental. But the whole process will surely be completely automated once the digital video gets into the Google workflow. I can not believe that they employ ‘street view editors’. If they did, there is just a chance that one of them might intervene in my interests: “We can’t have our view of Florence messed up by that tramp in sloppy jumper at 0.016181,0.038409&z=15. Can someone erase him?”. 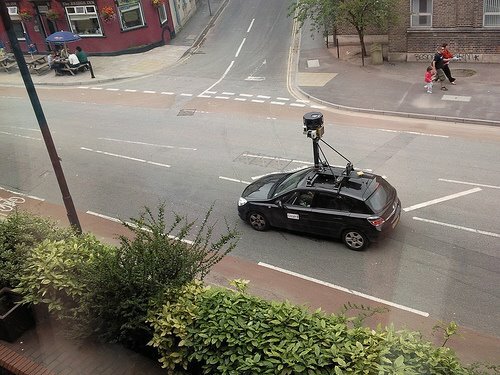 Nope, its bound to be completely automated and I am afraid that I am now immortalised as a smudge in Google Street View. It is quite extraordinary the way in which the web now touches us in the most specific and exact detail throughout our lives, and so many web systems are now ingesting mundane information from all corners of the earth.